Your sales floor is a living, breathing entity that needs to change – frequently – in order to flourish and it’s your job to make that happen. If your store is filled with the latest and greatest product, but your sales are in a rut it, it could be because your customers are bored. They come to your store not just to buy; they come for ideas and inspiration. And they come to be entertained – even when they don’t buy anything; it’s the experience that brings them back. When you look hard at a Target store you see a neutral sales floor that allows the merchandise to pop. The sales floor serves as a backdrop for powerful signing and creative displays that encourage you to fill your cart with things you didn’t realize you needed until you got there. The store layout is designed to move you easily throughout the store. All store layouts are affected by the shape and size of the sales floor, with the common goal to expose shoppers to product and to gain maximum traffic flow. It’s said that 50 percent of your sales floor is never seen by shoppers, so the job of your layout is to create and control how customers shop the sales floor. There are many types of layouts used in store design, including the Grid, Loop/Racetrack, and the Free Flow layouts. In a Grid Layout, fixtures run parallel to the walls; they are easy to shop because they offer a clean sight line through the store, allowing the end features maximum exposure. Found most often in larger stores, Loop/Racetrack Layouts offer a clearly defined main aisle that circles through the store like a race track. Here, shoppers typically flow to the right and move up and down the aisles in a serpentine manner. Loop layouts offer maximum product exposure because the perimeter walls are just as important as the end features. Target and Best Buy are two good examples of stores that utilize a Loop layout. Specialty and boutique retailers frequently utilize a Free Flow Layout because it allows for the most creativity. In a Free Flow layout, there are no set aisles or straight lines; fixturing is placed at angles that encourage shoppers to easily move throughout the store. This layout offers many opportunities to romance the merchandise and create unique display vignettes. Every store has an area called the Decompression Zone. The size of your Decompression Zone depends on the size of your sales floor, but it’s generally the first 5’ to 15’ inside the front door. Its purpose is to give shoppers a chance to transition from the parking lot (or sidewalk or mall) to shopping. Understand that shoppers will miss anything you place in the Decompression Zone – that’s why it needs to be an open and uncluttered space. Floor signs, baskets, class schedules, etc. 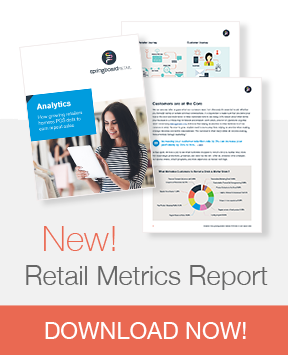 belong just beyond your Decompression Zone where shoppers are more likely to see them. Start at the end of your Decompression Zone and spread your arms out at shoulder height with your index fingers extended. What’s inside the “V” your arms make is called is the Vista – the area that builds a shopper’s first impression of the store. The Vista is where you place Speed Bumps, displays designed to slow shoppers down and refocus them on the task at hand. Speed Bumps also set the tone for what shoppers can expect to find throughout the store, so choose cross-merchandised groupings of irresistible product. Nesting tables and single tables clustered together make a small, but mighty impact. Remember to change your Speed Bumps at least once a week, whether they need it or not. This single display plays an important role in creating your store’s ambiance. The V will help you locate your most important Power Walls. Start by following your nose down your right arm to the tip of your right index finger – the wall you are looking at is your front right Power Wall. It’s a highly profitable space, so use it to feature not-to-be-missed merchandise and update it frequently. Try not to house your cash wrap at the right front of your sales floor, in the center of your Lake Front Property. Ideally, your cash wrap should be located at a natural ending point in the shopping experience, on the left side of the store, close to the front, or at the center of the store. If your store’s footprint makes it impossible for shoppers to enter your store and turn right, then everything is reversed: the front left becomes your Lake Front Property. Begin at the front and walk your entire sales floor to look for other key display areas, noting which ones stand out and will require on-going visual merchandising attention. Now, grab your camera and take photos of your sales floor. This is an important step because the camera will see what you cannot, showing you areas that need attention, holes in displays that need to be filled with merchandise, displays that need signing, and more. 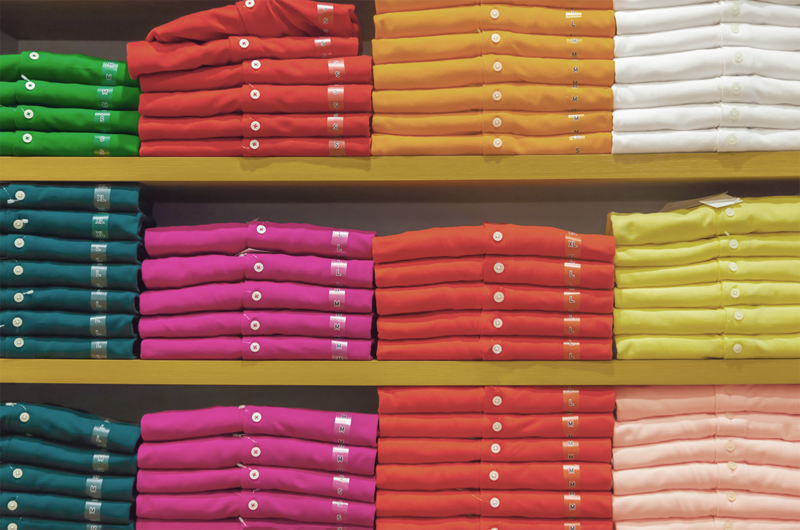 90 percent of customers enter a store and look or turn to the right. Plan. Before you start dismantling a display think about what will replace it. Planning forces you to think about your product: What’s new and needs to be featured? Which product isn’t moving where it’s currently housed and needs a boost? Is there a seasonal theme or local event you wish to highlight? Click here to learn more about using your POS data for merchandise planning and buying! Store Fixtures. You need several types of fixtures in your store, including wall units, gondola type workhorses that house a lot of product, plus smaller fixtures, like stacking tables for Speed Bumps and Merchandise Outposts. In general, fixturing should be invisible, blending in with the decor so that the merchandise stands out, not the fixture. Note: When placing your fixtures remember that the Americans with Disabilities Act requires a minimum of 3’.6” in-between fixtures. Signing. Most stores we visit are undersigned. Now, no one likes a sales floor that’s possessed by sign pollution, but displays should be signed when it’s appropriate. Studies show that 70 percent of purchases are made in-store, so strong signage helps in the decision process. Your signs should be professional, displayed in sign holders, and represent your brand. If handwritten signing is part of your shtick then go for it, otherwise opt for signs that are professionally printed on neutral colored card stock. Choose a typeface that’s easy to read, and don’t use anything smaller than a 30-point font. That way the majority of shoppers will be able to read the sign, even when they forget their reading glasses. Utilize both upper and lower case letters: all caps are hard for older eyes to read, and younger shoppers think you are shouting. Lighting. There are several types of lighting used in stores: General (overhead), Task (cash wrap, cutting tables, service areas), Accent (to highlight merchandise and direct attention to certain areas of the sales floor), and Decorative (chandeliers to add character or table lamps to add ambiance to a display). It’s important to note that we need three times the amount of light to see in our 60s as well we did in our 20s. If you have Baby Boomer customers and your lighting is bad, there’s a good change they cannot see your merchandise clearly. If you have not relamped your store recently, contact a lighting expert who can recommend the proper lighting for your sales floor’s unique footprint. Cash Wrap. You never want customers to stop thinking about merchandise, even when they are paying for purchases. Take advantage of the fact that women are big impulse shoppers by displaying small, high profit items at the cash wrap. If you have a wall directly behind your counter, use it to tell a story or to showcase important product. If your store has checkout lanes, position displays with impulse items close by. Store layout is an art but it’s also a science. Over the years, retailers have left a trail of lasting techniques that are still utilized by successful retailers today for one, simple reason: they work. Study the bones of the stores you visit and you will see how these universal store planning truths have been tweaked for each type of merchant. They’ll work in your store as well. If you’re not sure what to do first, give us a call, or email photos and we’ll brainstorm ideas with you to help get you started! Rich Kizer & Georganne Bender are nationally recognized retail consultants, speakers and authors who have been named two of Retailing's Most Influential People. Their award-winning Retail Adventures blog was named the Top Retail Blog by PR Newswire Media, and is included in the Top 25 Websites for Retailers, Top 50 Retail Blogs, and the 7 Best Retail Publications - just to name a few! 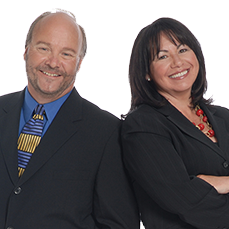 Rich and Georganne are experts on generational diversity, consumer trends, marketing and promotion, and everything retail, so to learn more about their professional services, click here.